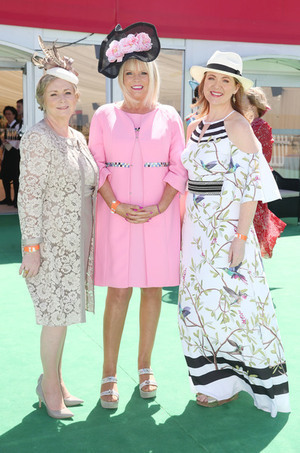 From left: former Minister, Francis Fitzgerald, Minister Mary Mitchell O Connor and Senator Catherine Noone at the Dubai Duty Free Irish Derby at the Curragh Racecourse, County Kildare yesterday. 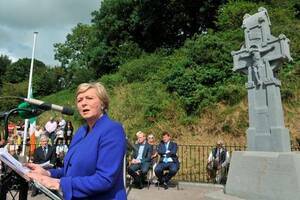 …Speaking at a private Fine Gael fundraising event in Tipperary, Ms [Frances] Fitzgerald said it was essential that the next Cabinet had 50pc female ministers and insisted women should not accept anything less. 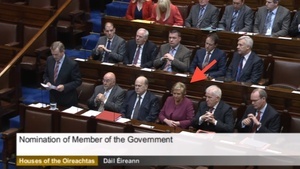 …The former justice minister said that, unlike Mr Varadkar, she “didn’t wake up at 15 and decide to become the Taoiseach”, before adding that women get involved in politics because they have an interest in causes not power. 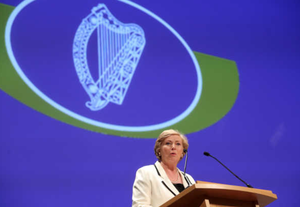 …Ms Fitzgerald also told the audience that she forced the Government to increase the general election gender quota from 20pc to 30pc. Posted in Misc and tagged Frances Fitzgerald, Gender Balance at 10:37 am on July 2, 2018 by Bodger. – can we please stop this horsesh|te about importing things from American culture wars and using them in an Irish context where they are meaningless? The vast majority of TDs are white, just as the vast majority of accountants, plumbers, and binmen are white; the fact that there is one TD of mixed race means that non-white people are over-represented in the Dáil, proportionately speaking (probably – who cares, anyway). So, the same as a man then? One of those causes was turning a blind eye to corruption was it? Great cause that, sitting on your twot all day, doing feck all. Have these people any shame at all? You wouldn’t just lay low I suppose, after you’ve been given the boot for pretending you didn’t know what the guards were up to? No? Instead she’s giving lectures to the rest of us about women’s morals & motivations.. sh*g off like. maybe her cause and motivation is to not drive down the Dail steps. It’s working OK. As a ground radar scanner for the Irish Aviation Authority. Definitely not a Philip Treacy. looks like she was dragged through a hedge backwards..a rose hedge..much be in vogue. I’m not a fan. Makes her look pregnant. Let me be clear…..no hand, part or act in sweet fanny Adams. Have these people any shame at all? The pension pot and great wages not come into the equation? Isn’t being in politics for “a cause” the same as a “one issue politician” who knows SFA about anything outside that cause. Not sure her saying they are in it for a cause is a good tactic. How dare women expect to get paid for their work. 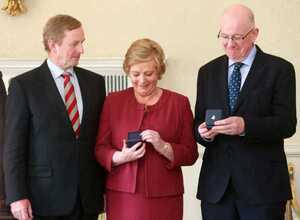 Are you sure that image wasn’t from the Pride Parade in Naas? Where can I buy those clothes? Two Euro Shop? Mary is mad for lurid pink. This is not the first time I have seen her in that kind of get up…. easier ‘job’ than teaching I suppose! you’d get a decent ride in her for a tenner, wha?! All bookings available through the handy app MyTaxes – formerly known as Hail Mary (Coughlan). jaysus lads comment on what Fitzgerald said rather then the get-up of the women…. If they were turning up for some sort of an official meeting and people were focusing on the clothes rather than content, I would be the first to agree with you. But given that the photo was taken at a horse show (where the whole thing is about who wore what, etc), I think it’s fine. In fairness they don’t have much dress sense and that’s coming from another woman. They are in the public eye you’d think they’d be more in tune with that. There’s a job there for a stylist. I couldn’t image Clare Daly in any of that get-up. The utter hilarity of them saying this at the DUBAI duty free Irish Derby. So women’s rights in Ireland but lets forget about how Dubai will whip a woman for being raped? Jane Ruffino doesn’t approve of Ladies Day at the races.